Arrr – Fell’s Point is rapidly approaching, and even though this will be my first year attending, I’m already getting that special tingly feeling I used to get just before PyrateCon. It’s the anticipation of knowing I’ll get to dress, act, and drink like a pirate with some of my best mates from across the country! 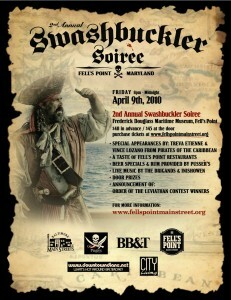 The attached image (click on it for the full size) has details of the Swashbuckler Soiree – hope to see lots of you there! This entry was posted in News and tagged bilgemunky live appearances, fells point by Bilgemunky. Bookmark the permalink. You mean the feeling to throw up on yourself.. can’t blame you. The JadeScorpion and the Kraken are ready for a raid on FellsPoint.This,Me hopes will be a Rum-Fun filled tyme for all ye pirates that plan to attend. After attending NOLA Pyrate Week;I’ll be ready for a weekend of Rum,Wenches and a bit of Pirate debauchery at FellsPoint. Saavvyy!!!! Au Revoir!! !